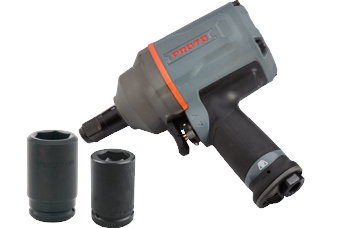 PROTO® 3/4" DRIVE AIR IMPACT WRENCH || Bolts Plus Inc.
Titanium housing helps to reduce weight, improve balance and ensure maximum durability. Ergonomically designed handle-forward design improves balance and control, helping to reduce operator fatigue. Robust twin hammer mechanism for efficient energy transfer and long service life. Ambidextrous forward/reverse lever can be actuated with a single hand, even with gloves on. Three position power regulator for forward rotation. Reverse rotation operates at maximum for highest breakaway torque. Feather throttle for maximum operator control. Side-fed, 6-vane air motor for maximum power and efficiency. Machined motor housing reduces number of parts, creating precision alignment, reducing wear, increasing efficiency and simplifying maintenance. 360º rotating air inlet fitting. Titanium exhaust deflector and muffler.